Glossy juicy pout is in but still at times you want to flaunt matte lips. In fact, a lot of you would choose a matte lip any day. I will review a lipstick that that is true to its name. It’s Matte yet Moist. 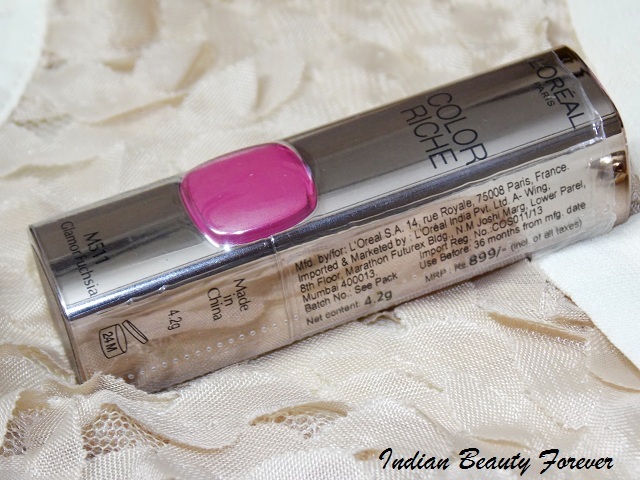 It’s L’Oreal Paris Color Riche Moist Matte Lipstick. These were launched as a part of L’Or collection and have been formulated in 12 exciting shades. Some of which like Raspberry Syrup, Lincoln Rose have already bagged the titles of hot favorite. 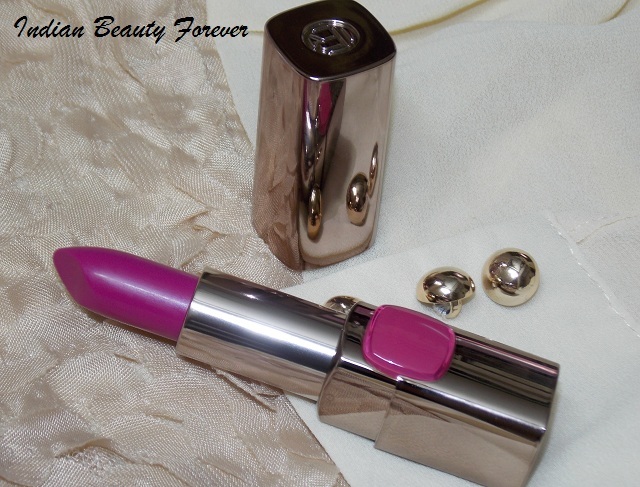 I will review Glamor Fuchsia. The range consists of bright, vibrant shades like reds, rosy pinks, orange to fuchsia to neutral browns. In short the range has variety of shades to pick and choose one for you. Brand says “Loreal Paris Moist Matte Lipstick is developed to lock in moisture without making your lips dry. The unique formula prevents bleeding and feathering of the colour to give you a long lasting finish! View: Let me start with its alluring and pretty packaging. 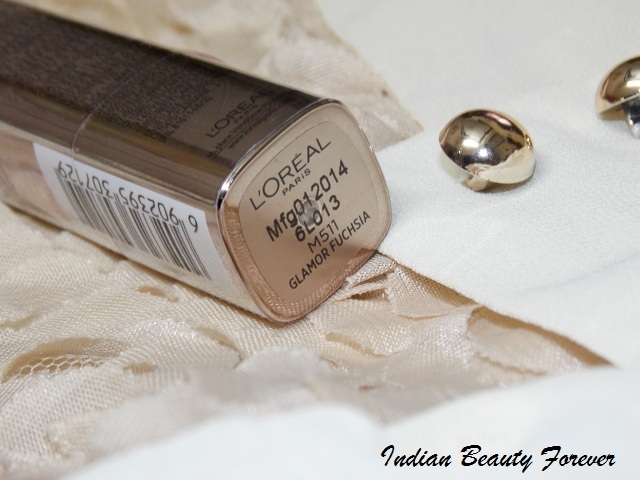 The lipstick comes in a bronzy gold metallic finished body with a beautiful L’Oreal Paris Logo carved out at the top and a transparent squarish pan that shows the color of the lipstick inside. Glamor Fuchsia has stuck true to its name, it’s a fuchsia with slight purplish undertones that will be quite evident if you have medium to dark complexion whereas on fair skin pink hues will be dominant. The lipstick has a very mild, hardly detectable smell. Whenever you come across a matte shade you will find it too drying or that won’t be matte but rather creamy matte but here it's like getting the best of the both worlds. You get a matte finish; completely matte, where you need not to compromise on or whine that it isn’t matte as per your preference or its matte but it over dried your lips. I find it matte yet it moisturizes and keeps my lips softer till the time it’s there. That moisturization part doesn’t affect its matte texture in anyways, which was surprises and amazing simultaneously! This has actually earned this lipstick extra brownie points indeed! It can give a vibrant intense color in two stoke while I like to keep the intensity tad low, therefore, I would go with just a single coat or as a stain. Fuchsia shades can be good to use as stains. At least I do!! Moist Matte lipsticks have this extremely smooth texture that just glides on the lips without tugging or pulling and yet feels very light and hydrating. During my testing time, I haven’t noticed that the lipstick feathered out or bled. It stayed on for around 5 plus hours and was faded after the meals. Once it bid adieu there would be a rosy tint left behind on the lips that explains its glorious presence on your lips. I have quite dry lips but I haven’t felt the urge to reach out for a lip balm before applying this lipstick at least in summers. can’t state the same during winters. On my eyelids, I am wearing L'Oreal Gel Matic Eyeliner in Deep brown. Please note on my lips it may look slightly glossy but that due to the lighting. Overall I have liked this range. Summing up with Pros and cons of this Lipstick. 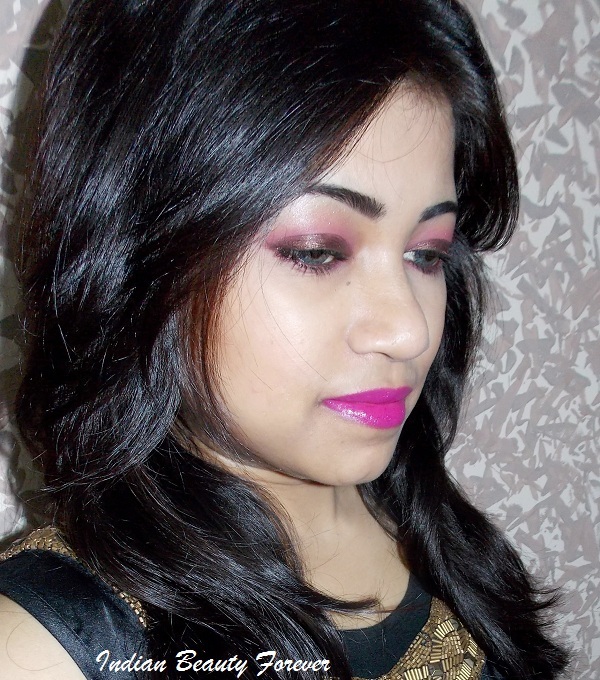 Take: L’Oreal Moist Matte Lipstick in Glamor Fuchsia is a beautiful, vibrant fuchsia that justifies its name. 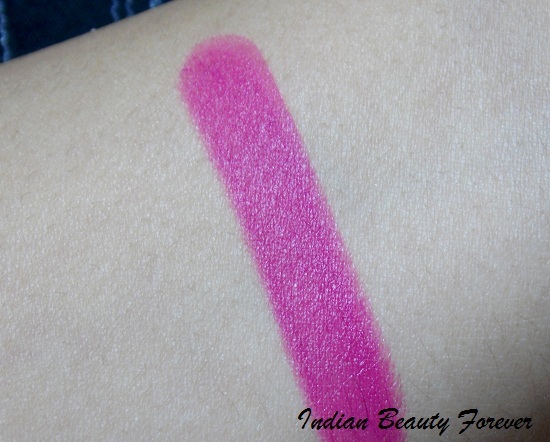 I find fuchsia to be very universal shades that looks flattering on most of the skin one. These lipsticks with the presence of Jojoba oil hydrates the lips yet successfully deliver matte finish. With a smooth texture to glide effortlessly on the lips topped off with great pigmentation these lipsticks are worth exploring. It’s just the price that hurts considering they aren’t very far behind MAC lipsticks. PR Sample: Review is unbiased and honest as always! I loved the makeup so much babe :) x the color suits yu best.. Thank you so much Agni!! Niesha you look so good!! very bright shade. looks really adorable on u! This looks and sounds amazing!!! I have yet to buy any l'oreal lip products recently but I NEED a moist formula for my lip products! I think you should try it as they are quite hydrating. Thank you Subha! Good to see you after such a long time. I so agree. :) Thank you dear. 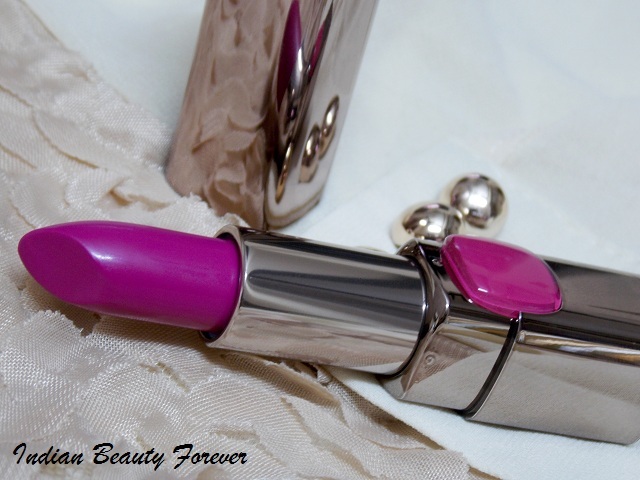 this is my fav lipstick at the moment, its super gorgeous!! Oh my my! This looks killer on you ;) and I totally loved your eye makeup. Its a gorgeous shade and you always manage to steal the show with ur pretty fotds! loved the shade! n ir eyemakeup too! aww Thank you so much Fiona!! :) Actually I am busy as well so, couldn't reply on time. Thank you so much Zahira!! 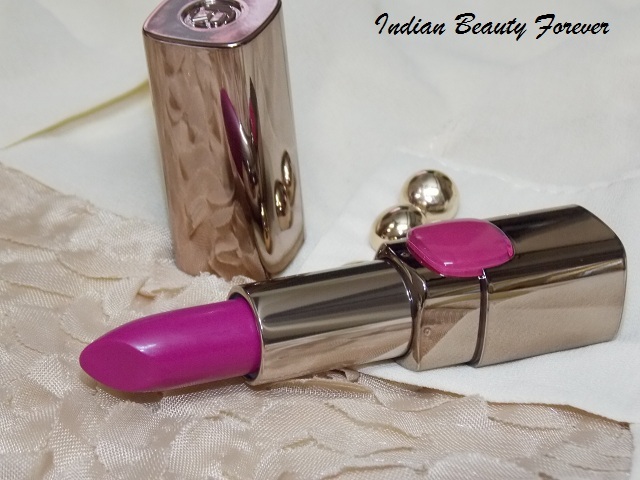 stunning.... loreal moist matte lipsticks are really creating a sensation in beauty world right? Thank you Richa!! Lincoln rose is such a pretty color. :) Wish the range could have been cheaper. Beautiful shade.. looks nice on u Niesha! What a bold shade!! looks really hot on you Neish <3 I got a coral one from this range and loving it a lot recently. Glad It Stays On For So Long!